Danish Carnival "Axe" float to draw muslim criticism!? At this year’s Carnival Monday parade in Düsseldorf, float builder Jaques Tilly adopted the attempted attack on Danish caricaturist Kurt Westergaard as his theme. The famous floats from Tilly traditionally remain top secret at headquarters until Carnival Monday morning. As is obvious in this case, this “Axe Float” will most certainly pull along some protests from Islamic groups behind it (Translation of German PI-article by Anders Denken, Source: Düsseldorf Blog). File in the category of "You couldn't make this stuff up", former Gitmo detainee, Moazzam Begg, is on his way to starring in a new X-box game. The new game, Rendition, is being developed by a software firm in Scotland and lets players control a Guantanamo detainee who is trying to shoot his way out of the prison. Begg's "expertise" was called upon as the game's creators needed to know the layout of the prison thus he was initially hired as a consultant. "We have had a lot of hate mail about this, mainly from America, saying things like, 'Don't dare put out a game that shows them killing our soldiers," Zarrar Chishti, director of Scottish software company T-Enterprise, told the U.K.'s Daily Mail." Hate mail? Sounds more like adamant requests not to make an outrageous "true to life" game about killing American (or British) soldiers - can't imagine why anyone would find that offensive and unacceptable - can you? Zarrar Chishti, director of the software company, insists that only "mercenaries" will be killed - mercenaries at Gitmo? - now that sounds a bit NON-realistic. Chishti further states: "We are expecting an extreme reaction to the game in the US. But we think it will sell well in the Middle East." Well - guess that should come as no surprise - but you can be sure that the "extreme reaction" in the USA WON'T look like THIS or THIS over THIS. At a cost of £250,000 or $405,000, the game/atrocity is scheduled to go on sale this coming October. Just another glaring example of: For many people - when it comes to money - there is no morality. Abit off topic but yet pertinent in addressing what seems to be the never ending idiotic and out of control political correctness war on British institutions that has descended all the way down to a dolls and toys. It is noted that this little stuffed animated persona is NOT the teddy bear, named Mohammed, that has caused the near beheading of a British teacher by bloodthirsty outraged muslims. OR the innocent piggy bank that has been a traditional give-a-way to children upon opening their first bank account - now banned due to offending - who else but the muslims. Nope this is the little golly who used to adorn jampots and is a stuffed toy that has been carried around and tucked into bed with British children of ALL colors - for generations. Yet supposedly one pea brained individual can snap their "offended" fingers and deny a market trader her livelihood as well as her customers from purchasing a British tradition. In the upside down NuLabour/EU Politically Correct world it is the bottom rung individual that tells the majority what they can and cannot do, say or even tuck into their children's beds. A market trader who made a brisk trade in Gollies has been ordered to remove the dolls from her stall after a single complaint. Jennifer Richmond was told to take the Gollies off display at her gift stall at the Leyland Indoor Market, Lancashire, when a resident objected to their sale on racial grounds. Ms Richmond said she had sold 200 of the dolls in the last few months showing the Gollies had become a popular feature of her market stall. But councillors disagreed and suggested she remove them. Ms Richmond said: "There is nothing racist about the Gollies at all. We have three Asian stallholders on the market and none of them find the dolls offensive. "A lot of people like them because they were popular in their youth and we have sold hundreds since we got them in about five months ago. "It's farcical, we wouldn't be selling them if they were wrong and we checked with the wholesalers first - they are laughing at the situation. "We've even put handcuffs on one Golly in case the police come to take him away like they did when they raided a shop in Manchester. "It is probably someone who does not know they are legal. One petty person has opened a stupid can of worms and it has been blown out of all proportion." The Golly was originally a children's literary character from the 19th century and was adopted as a mascot by a jam manufacturer in 1910, before being dropped in 2001. 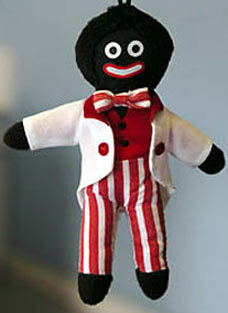 They have since become collectors items, but have courted controversy over their perceived racial connotations. She added: "We have been here for about two years and do very well. The dolls range in size and you can buy them from £18.50 to £3 for the smallest ones. "There is no law against them, they are not illegal and we want to be able to put them back on display as soon as possible." Councillor Colin Clark, deputy leader of South Ribble Borough Council, said: "We received a complaint last week from a resident who objected to the sale of these dolls. "We referred these concerns to the stallholder and suggested that the dolls be removed from display while we investigated the complaint."